A 47-page indictment alleges that Hunter and his wife spent more than $250,000 in campaign funds on family vacations and golf rounds, clothes and video games, fast-food runs and dental bills, tickets to “Riverdance” and SeaWorld, airfare for a pet rabbit and 30 tequila shots for a bachelor party, among other personal expenses. Responding to these allegations, Hunter took a page out of President Trump’s playbook and claimed he was being targeted for political reasons by Democrats at the Justice Department. “This is the Democrats' arm of law enforcement,” Hunter said of the Justice Department, which is led by Attorney General Jeff Sessions, a Republican. According to prosecutors at the U.S. Attorney’s Office for the Southern District of California, the congressman and his wife, Margaret Hunter, stole more than $250,000 over several years and filed doctored campaign reports to the Federal Election Commission to cover their tracks. The Hunters have pleaded not guilty. In a Fox News interview Aug. 23, the congressman maintained his innocence and seemed to throw his wife under the bus. (We leave that gambit to the pundits.) He also argued that the whole investigation was tainted because prosecutors on his case attended a fundraiser in 2015 for Democratic presidential contender Hillary Clinton. The Aug. 21 indictment against the Hunters was authorized by a grand jury and signed by U.S. Attorney Adam L. Braverman, a drug-cartel-busting prosecutor who was appointed by Sessions in November 2017. Hunter doesn’t mention any of that. His beef is with two lower-ranking prosecutors: Emily W. Allen and Alana Robinson. Both are registered Democrats. Campaign records show neither donated to Clinton’s presidential campaign. Allen, an assistant U.S. attorney, is one of the prosecutors working on the Hunter case, according to the indictment. Before being replaced by Braverman in November, Robinson was the top prosecutor in Hunter’s district in the San Diego area, including when federal agents searched his home and office and other locations. Robinson was not listed as one of the prosecutors on the Hunter indictment Aug. 21, but it stands to reason that she was involved in the case while she was acting U.S. attorney in the San Diego area from January to November 2017. Neither the Justice Department nor the U.S. attorney’s office responded to our questions. On Fox News, Hunter referred to “three U.S. attorneys.” The third is Matthew J. Sutton, another assistant U.S. attorney in the Southern District of California. It’s not clear why he’s in the crossfire. Sutton attended the Clinton fundraiser, but “he has not been involved in the investigation of Congressman Hunter,” said Gregory A. Vega, the congressman’s attorney. Through his lawyers, Hunter requested that the U.S. Attorney’s Office for the Southern District of California recuse itself from his case because Allen and Robinson attended a fundraiser for Clinton on Aug. 7, 2015, at the home of Qualcomm co-founder Irwin Jacobs in San Diego. Tickets ran from $1,000 to $2,700, but neither Allen nor Robinson paid to attend the event. Both had their pictures taken with Clinton. Braverman and top Justice Department officials denied Hunter’s request for a recusal, according to the San Diego Union-Tribune. How did Allen and Robinson wind up at the Clinton fundraiser without paying for tickets? At the request of the Secret Service, apparently. The agency says it asked the local U.S. attorney’s office to send some lawyers in case they might be needed at this Clinton fundraiser. “If something goes wrong now you are a percipient witness and can’t be involved in the investigation anymore,” Chuck LaBella, a former U.S. attorney, told the Union-Tribune. Let’s leave this Clinton fundraiser aside for a moment and get down to brass tacks. A grand jury and a U.S. attorney appointed by the Trump administration approved the indictment charging the Hunters with a long and detailed list of crimes. Before the indictment was filed, the Justice Department also denied Hunter’s request for the local U.S. attorney’s office to sit out the case. In other words, the Trump administration found no conflict of interest or appearance of bias in the way prosecutors handled the Hunter investigation. The congressman’s claim — that the investigation was tainted because Allen and Robinson attended a Clinton fundraiser in 2015 — is unconvincing. It would be one thing had Allen and Robinson shown up on their own initiative, but the Secret Service says it asked for federal prosecutors to be present at this fundraiser. Unusual as that arrangement may sound, Hunter is blowing it up to huge proportions and arguing that no federal prosecutor in the San Diego area can touch him as a result. We don’t penalize politicians for defending themselves from criminal charges, but Hunter’s comments seriously distort the facts to suggest his prosecution was politically motivated. 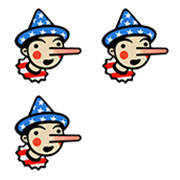 He earns Three Pinocchios.